Blackstone Audio presents a new recording of this immensely popular book. 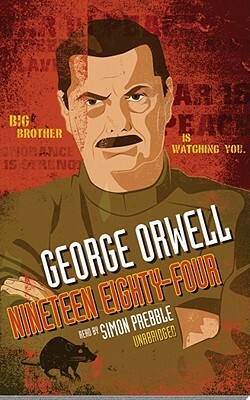 George Orwell depicts a gray, totalitarian world dominated by Big Brother and its vast network of agents, including the Thought Police, a world in which news is manufactured according to the authorities' will and people live tepid lives by rote. Winston Smith, the hero with no heroic qualities, longs only for truth and decency. But living in a social system in which privacy does not exist and where those with unorthodox ideas are brainwashed or put to death, he knows there is no hope for him. He knows even as he continues to pursue his forbidden love affair that eventually he will come to destruction. The year 1984 has come and gone, yet George Orwell's nightmare vision in 1949 of the world we were becoming is still the great modern classic of negative Utopia. It is a prophetic and haunting tale that exposes the worst crimes imaginable: the destruction of freedom and truth.